When the epicycle begins we can be impacted by another two cycles: 9-month and 9-day ones. Of course we can't experience it as clearly as annual cycles. These two cycles are made as well as year-cycles from 1 to 9, having an effect in the same sphere as year cycles, but they are less expanded. If you want to find out your personal month number, sum the reduced moth digit and your personal year number, e.g. your personal year number is 9 and February is the month, you need to add year digit 9 to the month number 2 (corresponds to February). The sum is 11, and then you reduce it. So, February has a number 1+1 = 2, for an individual with year number 9. 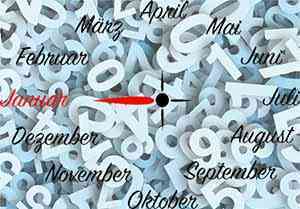 In order to find a day number: add a number of the day to the personal month number, in case of need - reduce the number. Month/day 9 is a time of summary, results and reforms.